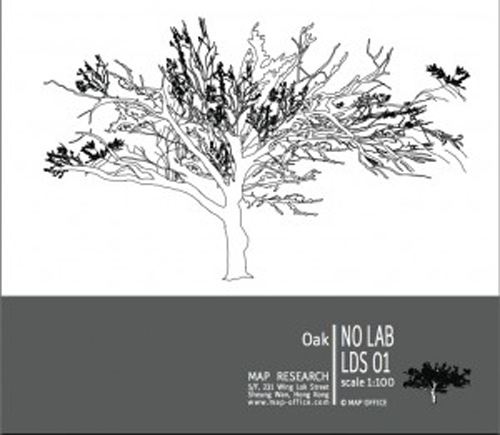 SL Resident Molly Montale has posted some very nice photos of her avatar in RMB City these days – looks like she even visited NO LAB in RMB City on the past two preview days. 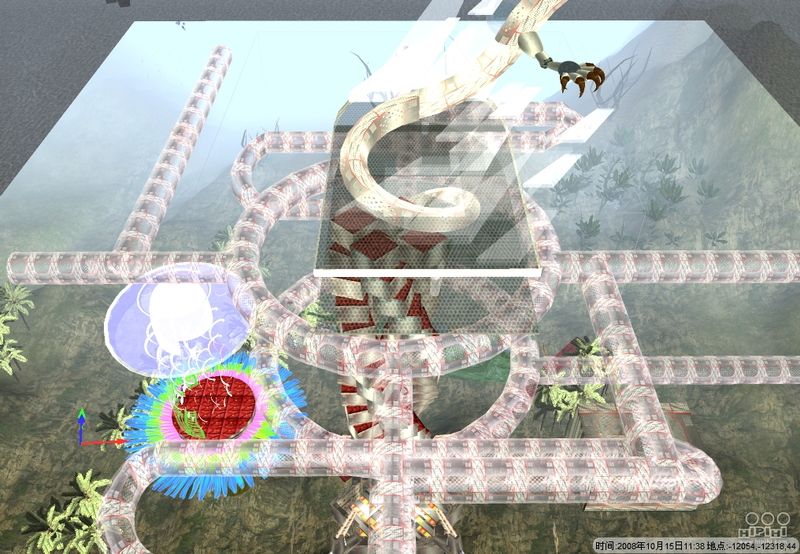 “The ability of 3D virtual world to manipulate time and space as a whole, far exceeding the 2D world. It provide a new meaning for the projection of human being’s collective memory and the collective cognitive. 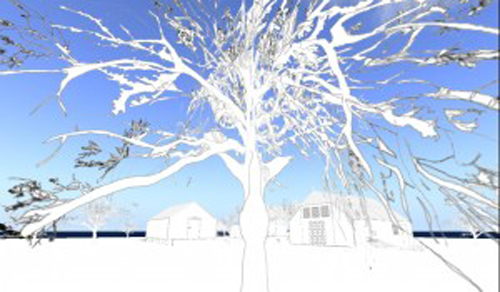 A drawing needs 3D experimentation… And the 3D experiment finally transitions the tree into a whole new universe. 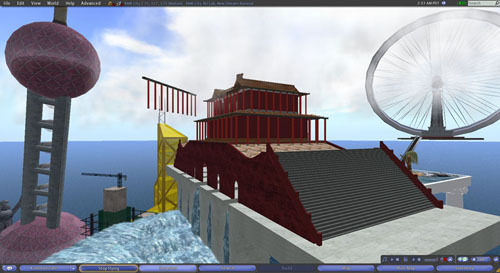 Calling itself an “immersive 3-dimensional virtual world where you can celebrate and explore aspects of Chinese culture and history,” the downloadable software and online platform is of course, extremely similar to Second Life. But with some major differences. 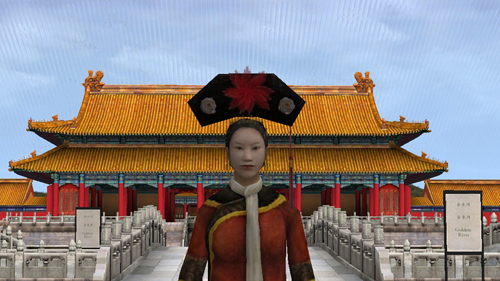 In the Virtual Forbidden City, you cannot customize your avatar, you cannot buy or sell anything, you cannot build anything… you cannot even fly. 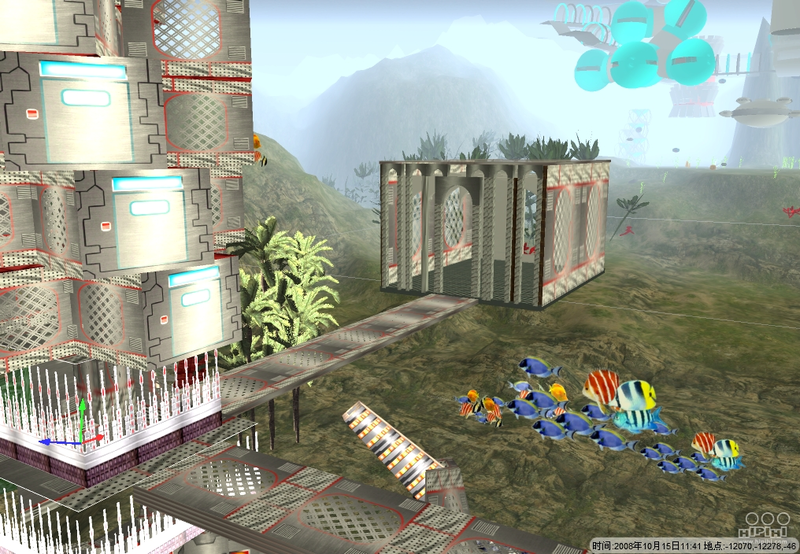 Of course, for people who are new to virtual worlds (clearly the majority of the audience being targeted), this platform is an eye-popping introduction, and astoundingly easy to set up and enter. Visually, the city is astounding; so rich in detail that I wonder if avoiding prim limits is one reason they decided to build this project outside of Second Life. The interface is simple and intuitive (and the way it allows you to quickly change perspective, instead of grappling with mouse-look, is something I kind of wish SL offered). And it seems quite useful as an educational tool– there are pop-ups and extensive information about Chinese history and culture, similar to a real museum visit. But it seems very much a passive experience. Yes, you can take some low-resolution screenshots (but cannot save them to desktop- you can email to yourself or a friend, but even then it just contains a link, not an attachment), and chat with other visitors, but you can’t really do anything else. Which is perhaps sufficient for a historical landmark, or the classic conception of a museum. It is a place to look at (but not touch) the past. 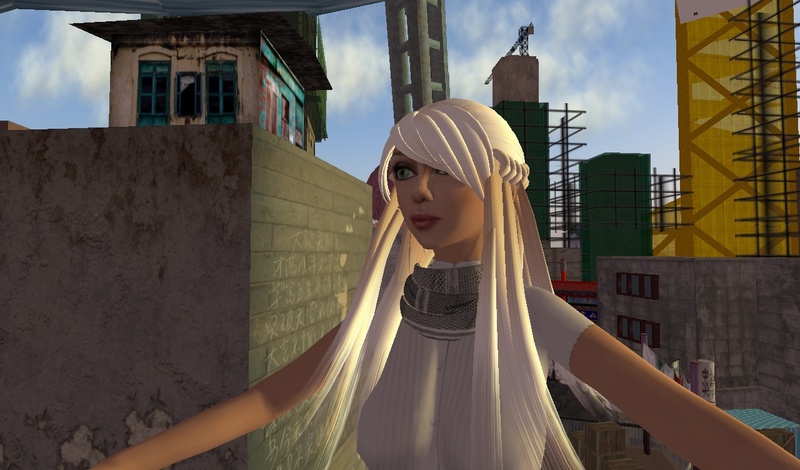 Since RMB City is more about the present, and the future (sometimes even we confuse the two), it seems vitally important that it exists in the larger metaverse and community of Second Life. 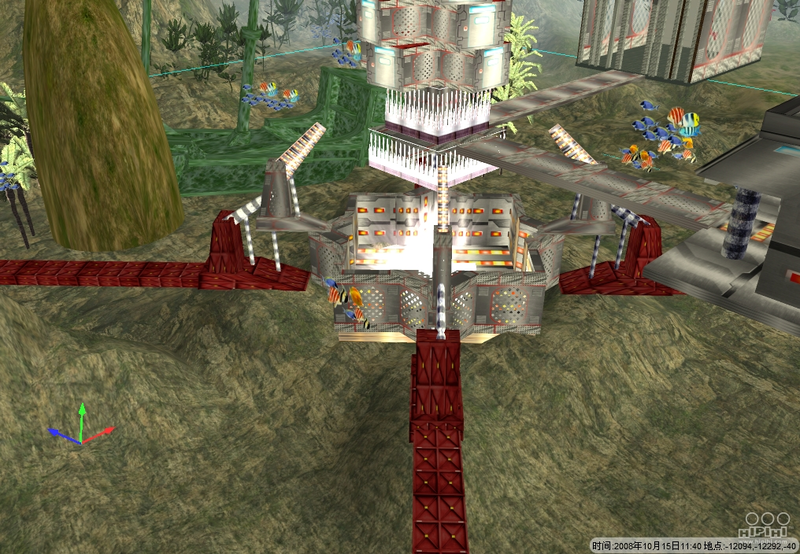 I personally wish that the Virtual Forbidden City had been built in SL instead. A place that’s a little messy, a little dusty, but open to change and challenge. A place to foster real conversation and interaction. A place where you can re-mix the myths and dreams of your nation into something strange and new. And most importantly, a place where you can fly. As part of the preview of Vitamin Creative Space‘s ‘the shop’, opening in Beijing this November, four of RMB City’s construction videos are now showing at Frieze Art Fair. 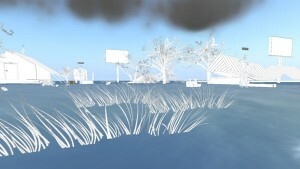 Venturing into the virtual spaces of Second Life, the Chinese artist invites you to “Play with your Triennale”. 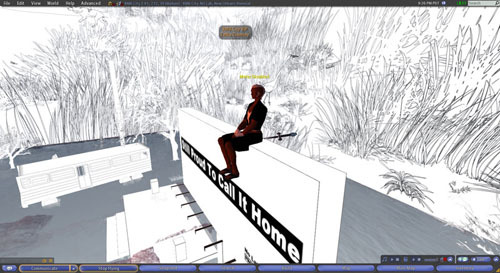 On the second floor of the Red Brick Warehouse, I made my first trip into Second Life. It almost didn’t happen; I was doubling back around looking for the Cao Fei exhibit when I spotted the entryway. Being familiar with some of the Chinese artist’s other work, particularly her photographs and videos that chronicle China’s youthful diversions (their adoption of cosplay and hip hop dance for example), I did not immediately recognize the computer terminal as her piece. To be honest, I thought it was one of those information portals that are commonplace in museums, train stations, and tourist areas these days. Cao Fei’s piece is titled Play with your Triennale and it takes place in a Second Life space created by the artist known as RMB City. 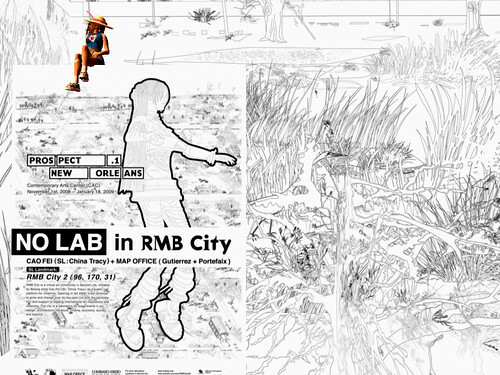 This virtual city (RMB is the Chinese national currency) is a project – over a year in the making – that endeavors to facilitate a public space for creation, construction, and discourse on the current and future state of the real and the imagined. Yet one with a noticeably Chinese slant: areas are given names such as “People’s Neo Village,” “People’s Slum”, and “People’s Love Center” and visitors will recognize distinct sights like the Three Gorges reservoir, the Oriental Pearl TV Tower, and the Olympic “Bird’s Nest” stadium, though patched together as per the artist and her team’s surreal vision. Any visitor from the general public is free to muse on this idea of having a hand in shaping a world where technically anything is possible. Technically, but not actually, and here in lies the catch: RMB City offers the freedom to imagine but it is not anarchy, the artist ultimately selects which projects are realized. Likewise, citizenship in the city is not to be taken lightly, as the “City Hall” requires a commitment in the form of a pledge of allegiance from avatars to RMB City. A dictatorship of sorts yes, but fair enough, she did make it and as the project advances and grows it will be interesting to see just what kind of ruler an artist overseeing a virtual community turns out to be. Over time, Cao Fei intends to collaborate with real world art institutions and individuals around the globe, bringing in like-minded entities to develop in the city as per their own vision. Beijing’s Ullens Center for Contemporary Art already has a building and another is in the works for the influential Swiss collector of contemporary Chinese art Uli Sigg. 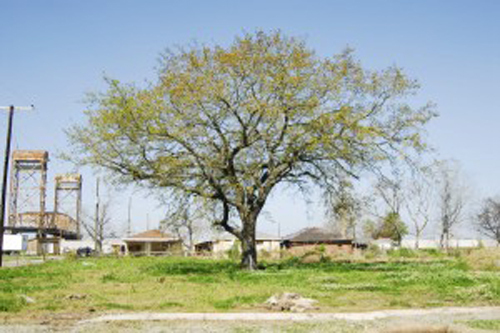 Buildings, however, are reported to cost around $100,000. 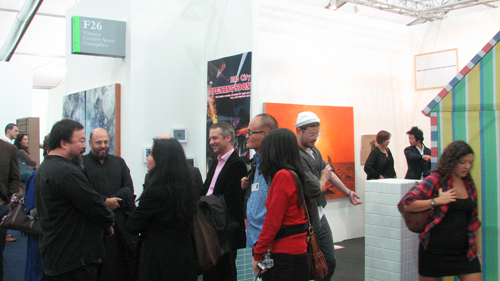 This is not RMB City’s first appearance at a large-scale art exhibition. 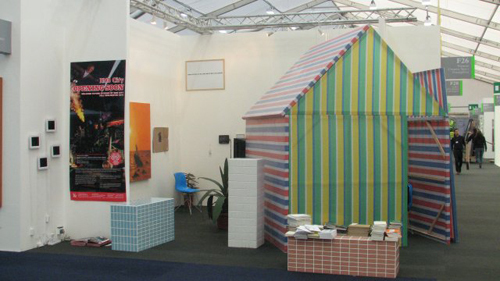 The project made its debut at the 10th Istanbul Biennale in September of last year and held a “virtual real estate sale” at Art Basel Miami Beach that December. Nor is access limited to the art world, if you have a high-speed Internet connection, a sophisticated enough computer, and a Second Life login (free), you can visit RMB City anytime from any part of the world. Videos of the project’s development have even been posted on YouTube. Considering the Triennale’s theme of ‘Time Crevasse,” which seeks among other things to examine the simultaneity and multiplicity of time and space and, through an emphasis on live performance, the singularity of the artistic moment, Play with your Triennale makes a striking contribution by bringing in the virtual world, along with universal themes like urbanization and identity, to the discussion table. 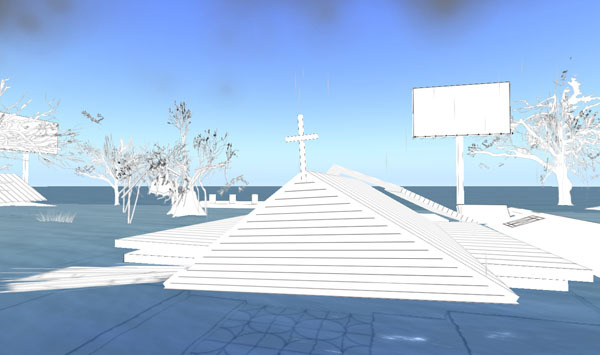 Never mind that the majority of the art establishment may not know what to make of it: navigating Second Life requires a set of skills not found in an art history textbook. RMB City also takes a rare, enthusiastic stand on the influence/invasion of technology in contemporary society, showing just what potential it holds. 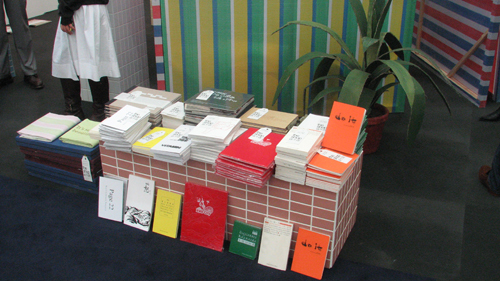 If the title Play with your Triennale is being at all facetious then it is more than likely poking fun at the solid, staid institution of the triennale itself. Although in many ways the goals of Yokohama and RMB City are similar: to brand a space as a global art capital and attract the requisite international collection of artists, curators, critics, and fans to demonstrate its relevance. Play with your Triennale however, by not only imploring audience participation but also by hanging its very outcome on that contribution, makes itself measurably vulnerable to viewer caprices, and that, despite the slick digital veneer, wields a certain fragile beauty of its own. As the Yokohama Triennale hits the halfway mark, two recent articles give prominent mention to Cao Fei and RMB City’s “Play with Your Triennale” project. Tokyo Artbeat‘s Rebecca Milner calls it a project “…that endeavors to facilitate a public space for creation, construction, and discourse on the current and future state of the real and the imagined.” Read the full article here. In ARTINFO, writer Lucy Birmingham assesses the Triennale as a whole, and mentions how Cao Fei’s piece is a visitor favorite, alongside a photo illustrating just that. 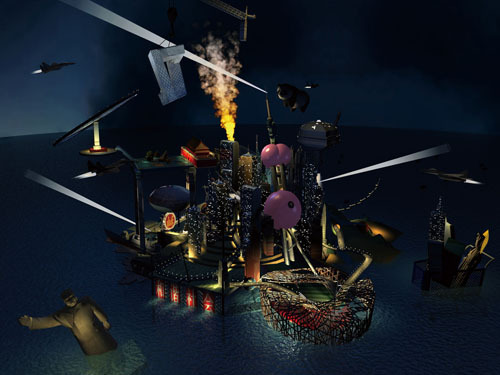 “On the other hand, the response has been more favorable… to Cao Fei’s virtual navigation RMB City Project, which invites players to help build her Second Life utopian art city.” Read the full article here. 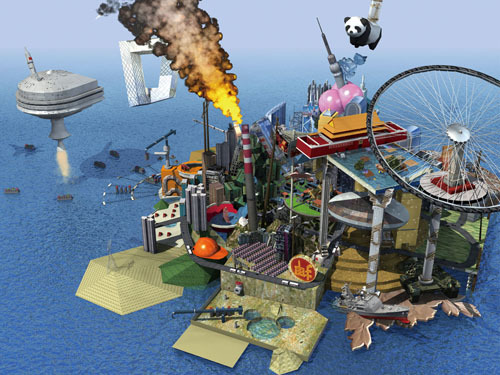 This month Cao Fei, one of China’s most lauded young artists, will open a city in the online virtual world Second Life. Its 10 leased buildings may be constructed from zeros and ones rather than concrete and steel but their prices are very real: they range from $80,000 to $200,000. A fast-paced, pulsating vision, “RMB City”, condenses contemporary urban China into an amalgam of symbols and icons, from shiny new skyscrapers to the much-loved panda. “The project comments on the current hyperactive pace of Chinese real estate development and urbanism, so it is fitting that the spaces of the city follow the market system conceptually,” Cao says. After opening a sales office at the Art Basel Miami Beach art fair last year, Cao – whose Second Life avatar is called China Tracy – transformed New York gallery Lombard-Freid Projects into a real-estate showroom. According to gallery partner Lea Freid, all the photographs exhibited were sold and all the promotional videos (in editions of 10) have been placed in major collections, among them New York’s Museum of Modern Art, Minneapolis’s Walker Art Center and the Louis Vuitton collection. 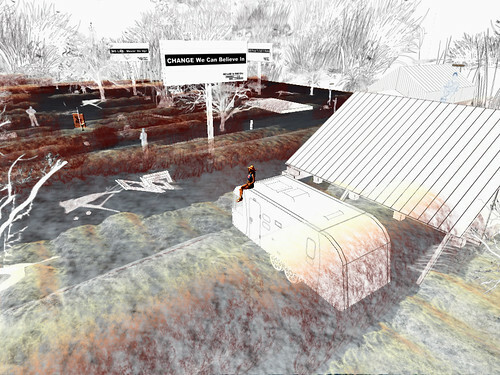 The project is now on display at the Serpentine Gallery in London. 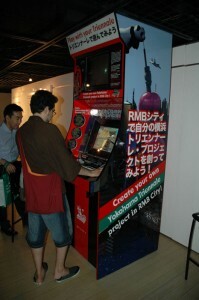 “RMB City” is an example of the new collectability of internet-based art. 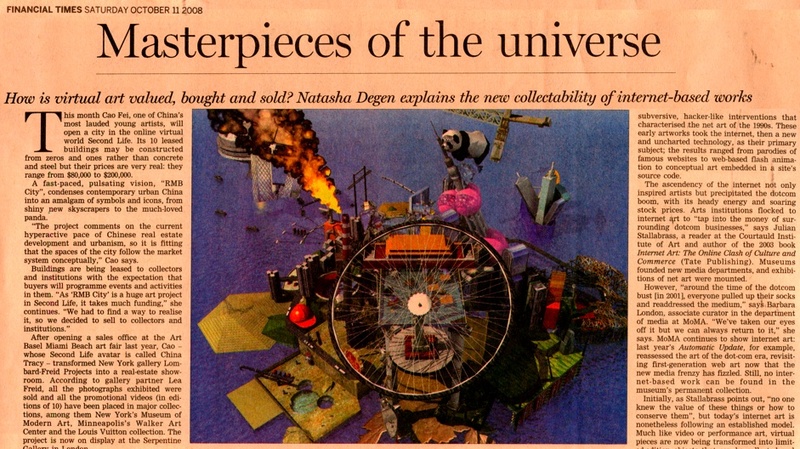 Whereas web artists once worked outside, and even in opposition to, the art establishment, artists today make their internet-based pieces into objects that can be sold in galleries and displayed in museums and homes. Cao, for example, has sold photographic and video documentation of “RMB City”, as well as opportunities to participate in the project. 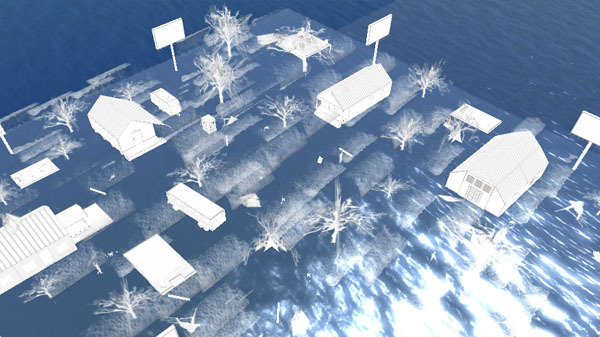 “‘RMB City’ is a new model for communication between collectors and artists in the virtual world,” says Guo Xiaoyan, chief curator of the Ullens Center for Contemporary Art in Beijing. The Ullens Foundation has bought access to a building in the virtual city, and will host events in the structure for the duration of the project, until 2010. City-wide, Freid says, activities will run the “gamut of arts and cultural disciplines, from poetry readings to lectures to visual art displays”, rendering the city a 24-hour culture centre. Cao Fei isn’t alone; more than 1,000 galleries exist in Second Life and many artists are using the online community to create art. 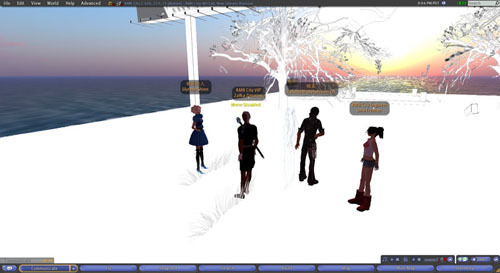 Eva and Franco Mattes make portraits (at $10,000 a piece) of the avatars, or digital surrogates, that people create to participate in Second Life. 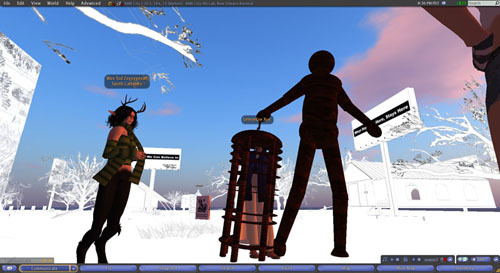 They’ve also reenacted, again in Second Life, a series of historical performance art pieces, including Vito Acconci’s “Seedbed” and Marina Abramovic and Ulay’s “Imponderabilia”. Another duo, eteam – artists Franziska Lamprecht and Hajoe Moderegger – have maintained a public rubbish skip in Second Life for the last year, documenting the project with still images and text. This new kind of web-based art reflects the phenomenon commonly known as Web 2.0. The term refers to the increasing interactivity of internet-based technologies, epi-tomised by websites such as Google and Wikipedia, in which users drive content. 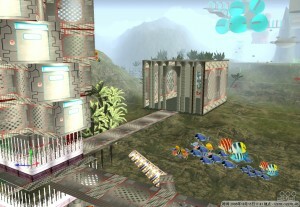 Web 2.0-style projects contrast with the subversive, hacker-like interventions that characterised the net art of the 1990s. These early artworks took the internet, then a new and uncharted technology, as their primary subject; the results ranged from parodies of famous websites to web-based flash animation to conceptual art embedded in a site’s source code. The ascendency of the internet not only inspired artists but precipitated the dotcom boom, with its heady energy and soaring stock prices. Arts institutions flocked to internet art to “tap into the money of surrounding dotcom businesses,” says Julian Stallabrass, a reader at the Courtauld Institute of Art and author of the 2003 book Internet Art: The Online Clash of Culture and Commerce (Tate Publishing). 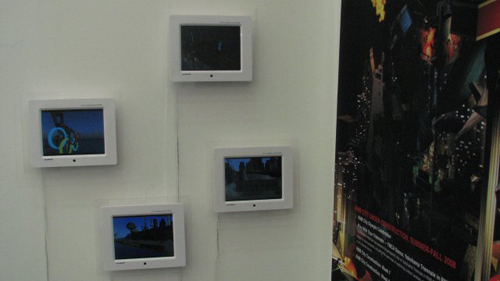 Museums founded new media departments, and exhibitions of net art were mounted. However, “around the time of the dotcom bust [in 2001], everyone pulled up their socks and readdressed the medium,” says Barbara London, associate curator in the department of media at MoMA. “We’ve taken our eyes off it but we can always return to it,” she says. MoMA continues to show internet art: last year’s Automatic Update , for example, reassessed the art of the dot-com era, revisiting first-generation web art now that the new media frenzy has fizzled. Still, no internet-based work can be found in the museum’s permanent collection. Initially, as Stallabrass points out, “no one knew the value of these things or how to conserve them”, but today’s internet art is nonetheless following an established model. 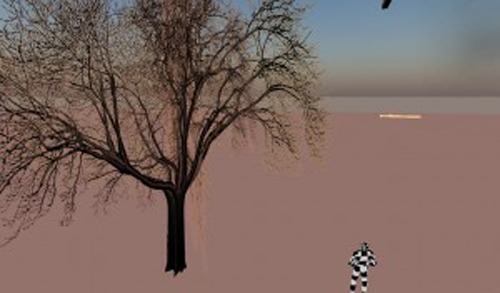 Much like video or performance art, virtual pieces are now being transformed into limited-edition objects that can be collected and displayed, even though the works are often readily available online. “Part of the way we’re marketing internet art is by taking it offline,” says Bryce Wolkowitz, director of Bryce Wolkowitz Gallery in New York. “It becomes an art object by putting it on a data storage system like an external hard drive.” At Wolkowitz’s gallery, such works range in price from $10,000 to $20,000. This saleable product suggests the importance of the object in collecting, even when the artwork is virtual. 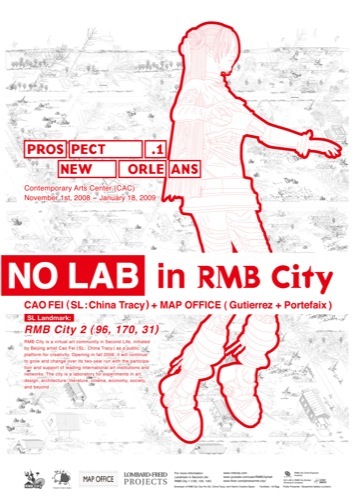 RMB City archive editor compared the data from one of the computer in the RMB City workday before and after the National day. In the late Sep and early Oct, you can see that in daily work, the visual software and the word processors are the major applications occupying member’s work. At October 5-6, Communication was prior than System Utilities at August 28-30, even though Categories of Business/Design were the same top 2. Following were the similar categories like Reference/Personal Productivity/Fun. Then when comparing the applications and sites, the former one were similar, Word or Excel, Photoshop or Illustrator/ Powerpoint, Finder was always open. The latter one varied a lot.